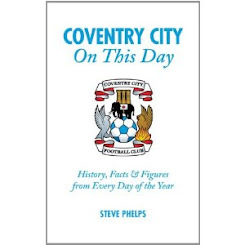 With no top six finish since 1969/70, season 1988/89 was a dream campaign for City followers. 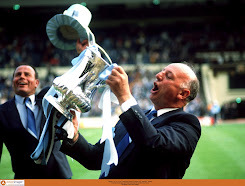 John Sillett's men were in third position on no fewer than eight occasions and following the 3-0 win over Charlton in game three were never lower than ninth. Their eventual seventh place can be attributed to a terrific team ethic but the club's Player of The Year, leading scorer and double hat-trick hero scored vital goals in key matches as City attacked down the flanks and entertained throughout. 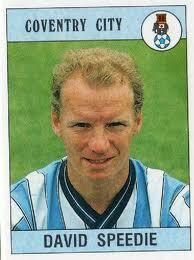 His name was David Speedie. Signed from Chelsea after the cup triumph, Speedie scored on both his first and last league appearances at Highfield Road. Initially signed as a strike partner for Big Cyrille, 'Speedo' replaced cup specialist Keith Houchen in City's line-up until the return to Coventry of Gary Bannister. While Lloyd McGrath tackled everything alongside him in central midfield, Speedie timed his runs into opposition penalty areas to perfection. 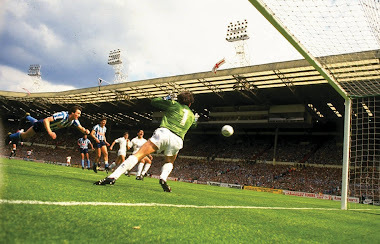 Two headed hat-tricks at Highfield Road displayed his prowess in the air. 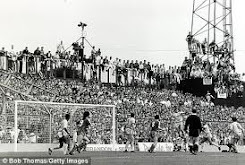 The 4-3 defeat to Middlesbrough (see clip) was one of the best games seen at City in the 1980's while five days prior to the Sutton debacle he took home the match ball with similar devastating finishing in the 5-0 win over Sheffield Wednesday. Following the demise at Gander Green Lane, home of Sutton United, Speedie then produced a delicious chipped winner at Norwich before repeating the trick in front of the West Terrace (see clip) with a wonderful lob over Hans Segers. 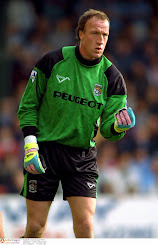 City supporting Southampton 'keeper Tim Flowers also succumbed to his magic later on in the season as the Sky Blues recovered well from the cup defeat. Kenny Dalglish signed him for Liverpool at the start of 1991, his final contribution the winning goal against Villa in a 2-1 win. Speedie's spell at City took in 141 games and 34 goals yet he never returned to play at Highfield Road following his departure. 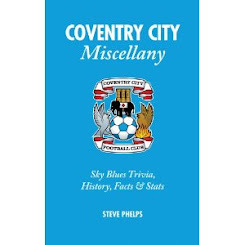 A competitive streak dovetailed with his amazing heading ability endeared him to Coventry supporters who appreciated his efforts in sky blue. 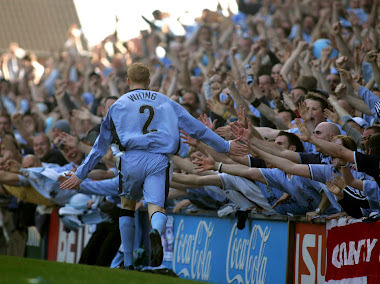 There was never a dull moment during his time at City, as the clips have shown, there was only one David Speedie. City now become the 11th side who played in the inaugrual Premier League season to be plying their trade in the old Division Three. Man City, Forest, Leeds, Southampton, Wimbledon, Sheffield United/Wednesday, QPR, Norwich and Oldham have all experienced what City will face in four months time. With the exception of Oldham and Wimbledon they have all returned to the second tier or better. Coventry City must vastly improve their communication and invest carefully in the playing squad before we can attempt to rival the recent success of Southampton and Norwich. The long-suffering supporters are craving just a glint of glory, we've done our bit, now's the time for the club to step forward on and off the pitch to bring that top six finish that most of us have never experienced.